The collapse of communist governments was followed by a shift to private enterprise and market-type systems of pricing, all of which undermined Comecon’s system of trade and by 1991 left the organization defunct. Under agreements made early in 1991, Comecon was replaced by the Organization for International Economic Cooperation, a group meant to assist with the move from centralized to market economies. Each nation was deemed free to seek its own trade outlets, and the obligation of membership was reduced to a weak pledge to “coordinate” policies on quotas, tariffs, international payments, and relations with other international bodies. (Britannica, May 5, 2017) Over time, the former Comecon countries moved away from the Soviet-era trade restrictions and developed trade relationships with other nations—particularly those of the EU and China. By 1991, 15 independent republics were established and their economies based on various scarce and abundant resources became independent. These developing economies flactuated over the years and finally report different outcomes and figures. Even after market and governmental transformation, economic and political attachements of the post-Soviet space among the member states persisted. Each post-Soviet republic keeps weaker or stronger ties with their former Soviet leader the Russian Federation which raises doubts of their proper sovereignty. What characterises nowadays‘ mutual economic relations of the post-Soviet space? Firstly, the international intergovermental organizations and the post-Soviet space participation in them characterise their world order perspective. Secondly, import and export orientations determine their trade tendancies. Finally the diaspora of post-Soviet republics in Russia and its money transfers and remittances comparison give the picture of dependency ties of the former Soviet space. Tables 1, 2, 3 below define the abbreviations of all formations and organizations, illustrate their logos and mention the location of their headquarters, occasionally the seats of agreement or convention signatures. Following tables 4, 5 and 6 use abbreviations and flags of 15 post-Soviet republics in the upper part and abbreviations of organizations on the left. The permanent participation of countries in particular formations/organizations employs sign . The countries that are not members are marked with . The sign means that the country is currently at the position of observer of specific organization and might or might not eventually become a member. Dialogue member of particular formation or organization is then labelled with the mark . Baltic space; Estonia (EE), Latvia (LV) and Lithuania (LT) are divided by different colours because of their distinguished geopolitical status. Formations/Organizations are split among economic both international and regional and security – international. They are selected by the level of importance for given countries as well as for demonstration of the diversity of aspirations. The participation in relevant international and regional formations of post-Soviet space republics is defined by appropriate anchoring between West and East to achieve the social prosperity, economic well-being, development and security. The Eurasian Economic Union is an international organization for regional economic integration which was formally created on 1st January 2015. Like the European Union, the EEU integration stands on four fundamental pillars – freedoms of movement of goods, services, labor and capital. Nowadays it has five members; Russian Federation, Kazakhstan, Belarus, Armenia and Kyrgyzstan (Table 4). Tajikistan represents the potential future member. The factual goals of EAEU for developing national economies were for example maximum 3% deficit of state budget to GDP or maximum 50% debt to GDP, but almost all the countries broke these targets by 2016. The Eastern parallel of the European Union is governed by its strongest member with the largest economy and decisive power – the Russian Federation. Altough, few experts claim it was established within the cooperation of European integration processes, majority inclines that it worked as its counterreaction. At its position of founder and unchallenged leader, Russia through the integration processes has the capacity to increase exchanges and grow economies mutually as well as act in its own economic and political interest. However, according to the raw numbers of economic indicators, the entrance to the EAEU did not significantly change the volume of exchanges nor the GDP of participants. Especially in comparison to the United States and European Union the GDP of EAEU is negligible. Its purpose is therefore viewed as strictly political with center in Moscow and may or may not limit the closer integration of post-Soviet countries in Europe. As shows the example of Ukraine, which declines any possible participation in the EAEU as it proclaimed its deep interest in the EU membership in 2014 or the case of Belarus which by its geopolitical nature cooperates with RF, serves as a reexporter to EU and declares that any EU integration, which will limit in the internal processes of the EAEU are out of the question. The low GDP and exchange results are equally influenced by the obsolete structures and low productivity of economies, incompetitivness to compete the developed western markets as in case of e.g. Belarus or Kyrgyzstan. EAEU so far faces serious issues on its way of evolution of successfully functioning multinational integration. Primarily, post-Soviet member countries suffer significant differenciation of their economic development and therefore their individual national interests differ too. About the specifics of EAEU existence is deciding Russian dominance in all of its aspects so the entity’s orientation is hardly executed on electoral basis. Secondly, post-Soviet republics‘ low level of economic integration is reflected in low frequence of exchange of goods, insufficent growth dynamics and their economic productivity stage with the legislative system gaps slowing the commercial coordination. Negative growth dynamics of goods exchange in 2015-2016 occured particurlarly because of the following factors; decline in oil prices and prices of other natural resources, slow growth of world economies and international commerce including complicated economic situation in EEU (Russian crisis and the fall of Ruble), western sanctions against Russia and Russian sanctions against EU, devaluation of national currencies inside of EEU. Volumes of exports within EAEU in the 1Q of 2017 finally increased by 39,2% in Kazakhstan, 38,5% in Belarus, 27,5% in Russia, 23,5% in Kyrgyzstan and Armenia by 38,5%. (Dilanjan, 2017) With certain recovery of economics especially in RF the development dynamics with EEU is gradually improving. Euroatlantic area is primarily defined by the membership in the European Union and North Atlantic Treaty Organization. EU and NATO actively promote business and investment treaties, coordinated advancement of common goals. It equally aimes developing bilateral relations with all countries within its territory. The United states are generally considered as the principal guarantor of the euroatlantic security also in the terms of reasearch and development, defense, economic and human rights leadership. From the Russian perspective, the United States uses the NATO and the EU as the tools for undermining the Russian hegemony in the post-Soviet space which Kremlin considers as the sphere of its interest. European Union integration processes are based on common business politics and political cohesiveness. They are characterised by the united inner market, free movement of people, goods, services and capital, european social model, strong protection of European consumers together with maintaining labor-law and egological standars and other politics. Latvia Estonia nad Lithuania are nowadays politically in Europe and moreover in the „westernized world“ as they became the members of the European Union and Schengen content, they all are NATO members and equally the Eurozone participants. Some of the post-Soviet space republics are active in the process of European integration under the Eastern Partnership Program. Among those countries are in particular - Ukraine, Moldova and Georgia. Armenian authorities were forced to quit their 3 year negociations process related to association treaties of EU integration when EAEU partnership was proposed to them because of the security aspects. As EAEU is governed by their long-term ally Russian Federation, Armenia needs any kind of support in Nagorno Karrabakh ongoing war conflict and protection against Azarbaijan. European integration is viewed by some of the post-Soviet countries as hardly achievable ideal of multilateral cooperation. However, even the states more positively inclined towards the EU have plenty of political reforms ahead to carry out before any potential negociations could begin. Morover, states like for example Moldova, Georgia, Ukraine and Armenia have their room to manoeuvre further limited due to their geopolitical boundaries of European and Russian political sphere of interest. The attractivness of EU integration is therefore in the conflict with Russian collaboration whereas Ukraine and Georgia already found out how dangerous the union aspirations can get. Other less integrated countries in Europe as Belarus or Azerbaijan operate through bilateral agreements and so far do not show any closer integration tendancies. European Central Bank is an official EU institution at the heart of the Eurosystem and the Single Supervisory Mechanism which performs a range of tasks in close cooperation with the national central banks within the Eurosystem and, for banking supervision, with the national supervisors within the Single Supervisory Mechanism. (ECB.europa, 2017) Its main aim is to maintain price stability, i.e. to safeguard the value of the euro essential for economic growth and job creation – two of the European Union’s objectives – and it represents the most important contribution monetary policy can make in that area. (ECB.europa, 2017) Baltic space; Latvia, Lithuania and Estonia so far employ the euro currency. Key tools of foreign politics for increasing global mobility in the Schengen area are related to consular and visa services. Its main goal is to protect the interest of european citizens abroad while providing them with information and assistance as well as the regulation of visits and residences of foreigners on its land. The regulations are meant to fulfil the great opportunities of freedom of movement while parallelly eliminate the potential risks linked to it. The sole members of Schengen content are the Baltic space countries. North Atlantic Treaty Organization focuses on the strategic interest of the European countries. It provides security and stability of euroatlantic area, helps to promote regional conflict resolution, functional and transparent control regimes in armament, including ban of weapons of mass destruction extension. NATO equally takes care of energetic, raw material and food safety supervision, fights illegal migration, reduces radicalization and persecutes international terrorism. Collective security of NATO binds all its memebers to their mutual defense, strong transatlantic attachement, adequate financial contribution to defense of each member in entire partnership and rebalanced politics of deterrence. NATO memebership is complementary to the European Union formation as it serves as the mean of its defence politics, foreign crisis management, stabilizater of marginal areas and the reducer of migration preassures within asylum and visa mechanisms. World Trade Organization aims for the transparent and firm rules for business and investments which would be eventually shared by the wide range of countries. The rules are set so the equality of low-income, middle income and high-income countries in trade is strenghtend and the integration of the low-income countries is promoted. For sucessful completion of those goals specific tools of bilateral and multilateral sustainable collaboration are being employed. Turkmenistan is the only post-Soviet republic refusing to join WTO, Azerbaijan, Belarus and Uzbekistan operate as its observers. The Asian Development Bank aims for an Asia and Pacific free from poverty. Its mission is to help developing member countries reduce poverty and improve the quality of life of their people. ADB in partnership with member governments, independent specialists and other financial institutions is focused on delivering projects in developing member countries that create economic and development impact. As a multilateral development finance institution, ADB provides: loans, technical assistance, grants, facilitates policy dialogues, advisory services, and mobilizes financial resources through co-financing operations that tap official, commercial, and export credit sources. (.adb.org, 2017) ADB operations are designed to support the three complementary agendas of inclusive economic growth, environmentally sustainable growth, and regional integration. ADB employs its limited resources in its areas of comparative strength—the core areas of: Infrastructure, environment, regional cooperation and integration, Finance sector development and Education, Health, Agriculture and natural resources, Public sector management (.adb.org, 2017). Eight out of fifteen post-Soviet republics happen to have a membership in ADB, Azerbaijan, Georgia, Armenia, Kazakhstan, Uzbekistan, Turkmenistan, Tajikistan and Kyrgyzstan. OECD is and organization that is engaged in world economic research and development cooperation and provides volumed range of statistical databases. By its practical and theoretical base it aims for assistence with reducing global imbalances and for eliminating the poverty in marginal parts of the world. Estonia and Latvia help with assistance provision as well as make their own data available and transparent within this organization. The eastern part of Europe in post-Soviet space analysis plays the role of the imaginary border between westernized multilateral and bilateral political mechanisms. Regarding easter routes to the EU and NATO there are their parallels the Euroasian Economic Union and the Collective Security Treaty Organizations members. Russian Federation is an architect of EAEU and CSTO and is considered by the western world as a sparkle of North Atlantic Treaty Organization creation (Johnson, 1983), Russian Federation is seen as a destabilisator of european safety zone and its future collaboration with western formations depends on the respect of RF to the international law and territorial integrity of its neighbours. The Collective Security Treaty (CST) was signed on May 15, 1992 for five-year term and now is being automatically prolonged. According to the Treaty, the member states maintained their security on collective basis same as NATO does. The Republic of Armenia, the Republic of Belarus, the Republic of Kazakhstan, the Kyrgyz Republic, the Russian Federation and the Republic of Tajikistan became the parties to the CST. (odkb.gov.ru, 2017) Today’s Collective Security Treaty Organization governed by Russia became the Euro-Asian organization not only in the geographical, but also in political and legal sense. Its member states participate in the European and Asian security structures, primarily, in OSCE and Shanghai Cooperation Organization. The decision was adopted by the heads of the Member States on May 2002 and transformed the CST (Armenia, Belarus, Kazakhstan, Kyrgyzstan, Russia, Tajikistan were its participants) into an international regional organization. It was the need for international – regional security and stability that introduced the Treaty that should help to face the today’s worlds‘ dynamics of new potential threats and challenges. (odkb.gov.ru, 2017) Cooperation in the framework of the CST maintained the principles proclaimed in the Treaty. The Black Sea Economic Cooperation (BSEC) came into existence as a unique and promising model of multilateral political and economic entity in 1992 and in 1999 was transformed into a full-fledged regional economic organization. 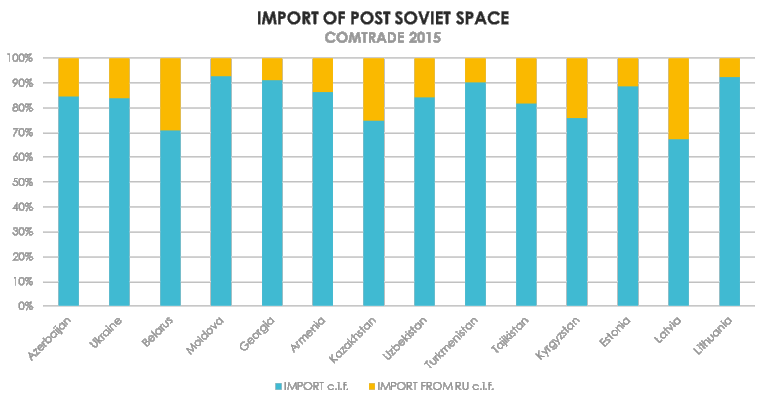 Following chapter captures economic comparison and mutual economic relations in figures of import and export of the post-Soviet space for 2015 in graphs, figures and tables. In some cases, the values of exports and imports in dollars are approximative because products are very often transferred to the different destinations and are reexported or reimported. Especially regarding protectionism as bans and quotas or closed borders due to the political conflicts, the products pass through the third country in order to be delivered to its final location. Russia happens to be the principal trade partner for the most post-Soviet republics so the extent of their trade cooperation is being manifested in the analysis. Therefore, Russian Federation is not included in export and import analysis classification with other countries. The only specified component of trade selected in the analysis are energetics. Due to its considerable proportion of trade, its economic and political influence is significant. For imports and exports to Russian Federation the abbreviation RU is being employed. The tables include 14 post-Soviet republics on the left in column and its parameters in the top row. The order of the countries within the tables depends on the emphasis of the table’s topics. For example, if it is overall exportation or overall exportation to RU, they are classified from the highest to the lowest values of export. 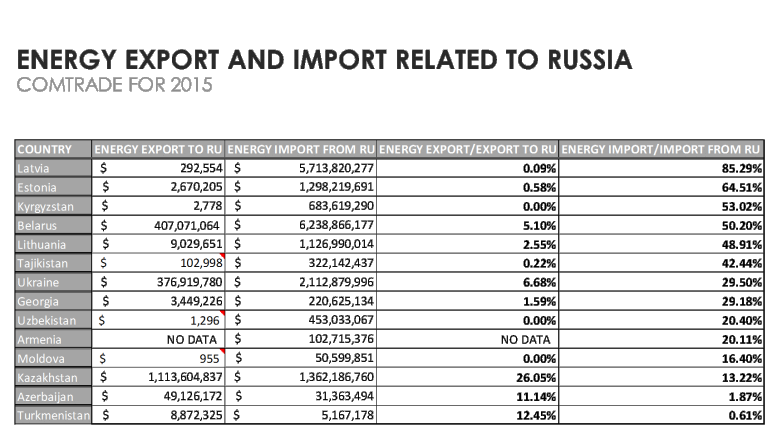 If the emphasis is put on the statement of the dependency, the table manifests for example the ratio imported from Russia or energy export reliance, the order of figures is lined up from the highest to the lowest percentages. All the graphs are the products of tables and include the title and relevant legend, the values of parameters are same as in the tables’ measured either in absolute figures in dollars or in ratios in percentages. The NO DATA saying within the tables in the analysis means that no information of the relevant data for specific year was available from the corresponding source. The comments in red inserted in excel placed in right upper corners of table brackets signify that the figure is approximative due to the significant share of reexport or reimport. The calculation of import and export ratios are done by simple shares of for example exports and imports related to RU to overall exports and import of specific post-Soviet republic. Russian Federation is the principal partner and the trade centre for the overwhelming majority of post-Soviet republics. (stat.wto.org, 2015) Ruble currency means a principal medium of exchange for the international transactions inside the post-Soviet space. That is why the Russian Federation was a natural selection for the unique trade partner of all countries in the post-Soviet space import and export analysis to demonstrate dependency of their economies on their ex-Soviet leader. In some exceptions, the European Union or China exportations or importations outweigh the Russian trade cooperation, namely in case of Baltic states whose export to Russia does not exceed even 3.5% (Table 7). (stat.wto.org, 2015) Some of the countries specifically aim for the politics of even redistribution of their trade flows to different strategic zones of influence as to Russian Federation (EEU), to the Western countries or to other countries, such as Belarus. 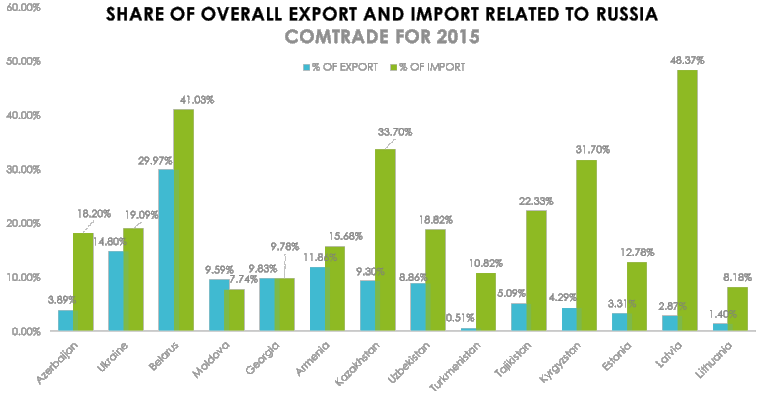 Its exports and imports to Russia although remain ahead the majority of the states (Table 11, Graph 12). Except for the size and strength of economy determining the influence on trade in its proximity, the geographical location, historically given political relationships and openess of the economy play no less important role. The international and regional formations serve as legal instruments promoting high level of multilateral trade cooperation among post-Soviet space economies. For example, Euroasian economic union or Commonwealth of Independent States Free Trade Area use legislative adjustments and administrative procedures facilitating exchanges, reducing the custom duty barriers. They coordinate monetary, tax, price, customs, external economic policy, mutual collaboration in the field of intellectual property (cisstat.com, 2017), matching technical norms, certification and license recognition, facilitating residences, visa-free relations and many other tools. Therefore, tracking the memberships of the republics in these formations from the previous chapter leads to high-level import and export figures. Out of members from EEA and CISFTA the Kazakhstan, Georgia, Moldova, Belarus, Ukraine and Armenia all exceed the boundary of 8 % to overall export to Russian Federation with AM peaking nearly 12%, Belarus almost 30 % and Ukraine reaching 15%. (Table 7, 11). Importations to RF to the total importations refer generally higher ratios and wilder flactuations, Latvia dominates with its import dependency ratio reaching 48% then follows Belarus at 41%, Kazachstan with 33% and Kyrgyzstan with nearly 32% (Table 9, 11). Embassies, governmental trade offices and agencies collaborating with economic diplomacy yet contribute to encourage the trade and aim for increasing the businesses profits. Private sector’s influence increases and international corporporations‘ power is unquestionable. Some of the experts might argue that their influence is nowadays principle, in Russia’s spread of economic impact this is would be the case of Gazprom. 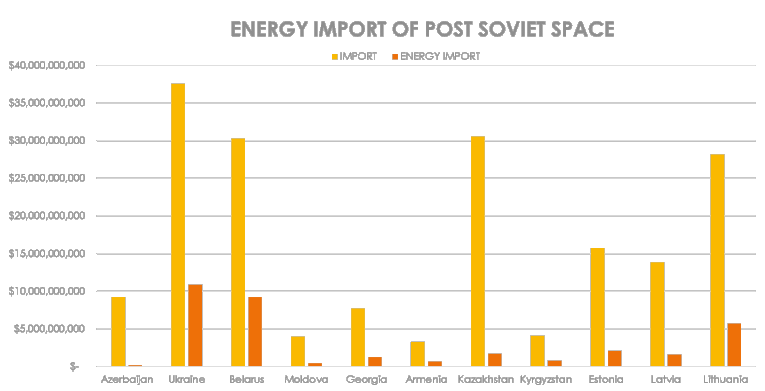 Former Soviet states imports of energetics (natural gaz and crude oil) to the overall Russian imports are particulrarly high for Latvia peaking at 85%, Estonia 64.5%, Kyrgyzstan and Belarus being above 50% (Table 19, Graph 20). 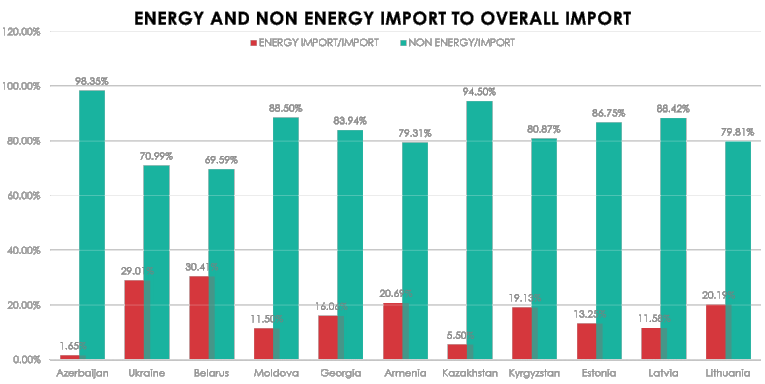 The only countries with lower values in energetic deliveries are oil independent Kazakhstan, Azerbaijan and Turkmenistan which is visible from the high level ratios of their energetics exportations within the table 13 and graphs 14,17 and low level energetics importations ratios within table 15 and graphs 16, 18. Otherwise pretty much all the states rely strongly on the RF’s natural resources. Contrarily, low figures of import and export might be explained by any kind of trade restrictions and protectionism. Tools as tariffs, bans or quotas that might mainatin the national property, prevent privatization, avoid deeper integration processes within the economic formations or cease the negative externalities where gaining monetary profit is not the primary aim. Not only the protection of economic sustainibility but also potential threat of territorial integration or any other kind of economic or diplomatic conflict might be very often a sparkle of restriction introduction. As in the case of Georgia where Russian authorities have put a ban on import and quotas on export to Georgia in the past due to the South Ossetia and Abkhazia (2008) territorial integrity conflicts eventually supressed by military strikes. After the bans and quotas were eliminated (2013) Georgia became the fastest growing importer from RF (Figure 21) which proves the importance of custom duty policies. 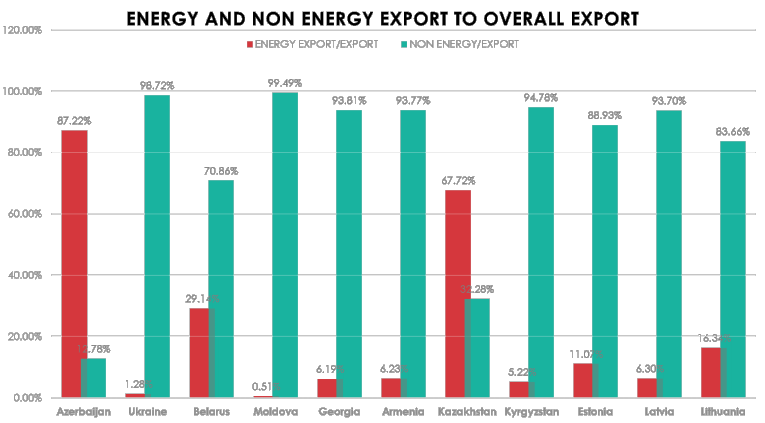 Even today, Georgia as the former part of Russia and its neighbour does not exceed even 10% both in imports and exports (Table 11, Graph 12). 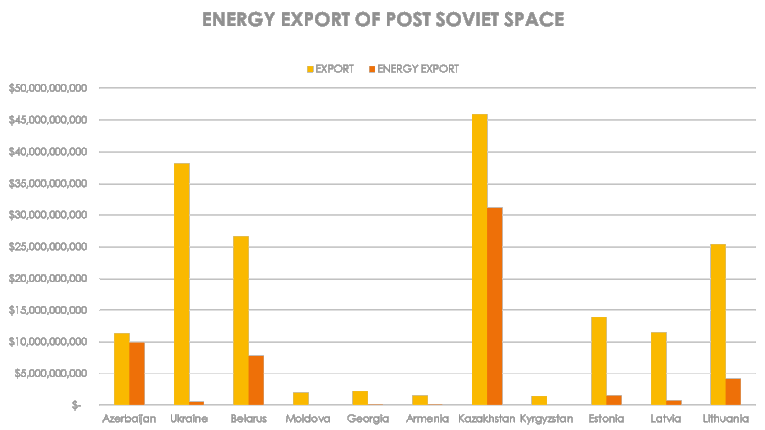 For maintaining the post-Soviet space on its orbit of influence Russia uses its premium wealth, the exportations of cheap energetic sources, in particular to Belarus or Ukraine’ big markets, crude oil and natural gaz importations make 6.2 billion dollars and 2.1 billion dollars respectively (Table 19). Belarus holds especially unique position in the trade partnership with Russia because they together form the Union State so the trade conditions are yet even more advantageous for both parties. The figures in export and import in case of Belarus dominate, exports to RF reach almost 8 billion dollars and imports 12.5 billion dollars according to the table 11. The export to RU ratio touches 30% (Table 11 and Graph 12) and import 41% (Table 13 and Graph 14). Together with oil dependence of Belarus this points out why the Belarus is the biggest and unrivalled Russian trade partner. Strong oil reliance is also happening at the Ukrainian side which owns primarily the agricultural and manufacturing resources. That refers to the energetics export and import playing the major role of the post-Soviet trade analysis, energy import ratio from Russian Federation exceeds 50% to overall imports for Belarus and nearly 30 % in case of Ukraine (Table 19 and Graph 20). Another reason than economic profit for closer trade cooperation is the strategical partnership. The strongest political ally of Russia from the post-Soviet space is Armenia and its small economy. The overall foreign direct investments placed in Armenia are almost always without exceptions the Russian investments. In 2016, they reached almost 2 billion USD and they are oriented on I.T. and communications (Kaspersky Lab and others, energetics, Gazprom and others), financial sectors (VTB, Rosgosstrach and others). Russia needs Yerevan in subordinate role from strategic point of view (Turkey, Iran, Azerbaijan, Georgia but currently also as the backbone for potential strikes in Syria or Iraq) as well as from the propagandist point of view in terms of promoting its own successful and expanding integration. 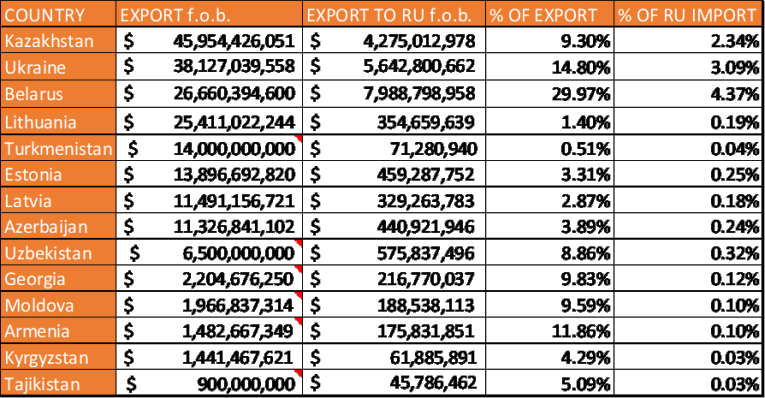 Importations from Russia make nearly 16% compared to other countries (Table 9, Graph 10), exportations then touch 12 % (Table 7 and Graph 8). Russian dominance in the commercial partnership with its ally is among others visible on the energetic subordination to Gazprom dictating the prices for oil. Iran was officially presenting more favourable commercial conditions in oil exchanges. Imports of Russian natural gaz and crude oil are up to 20% to overall import from Russia according to the table 19 and graph 20. The economic dependency on the Russian Federation which is a continuous and for many post-Soviet republics inevitable process which undermines their political and economic sovereignty. Although, according to the export and import figures above, the commercial interconnectedness seems unexpectedly rather overrated in terms of underdeveloped economies. In cases of countries with lower GDP and lower living standards where the collaboration with the strongest historical Euroasian partner RF might be taken into consideration, the interconnectedness is suprisingly low. However, this fact is partly caused by the weak frequency of overall exchanges related to the low dynamics and low productivity of their economies in corelation with their more developed partner. Simply, in smaller economies the low-level collaboration with Russia might be due to poverty such as in the case of Central Asian ‘s or Moldovian ‘s underdeveloped economies. Exports to the RF ratios of Turkmenistan, Kyrgyzstan and Tajikistan are down to 0.5%, 4.3% and 5% respectively (Table 7, Graph 8), exports to Tajikistan for 2015 then do not reach even 50 million dollars (table 11). Imports touch only 7.7% in case of Moldova and 11% in case of Turkmenistan which is compared to other economies significantly lower (Table 9, Graph 10). 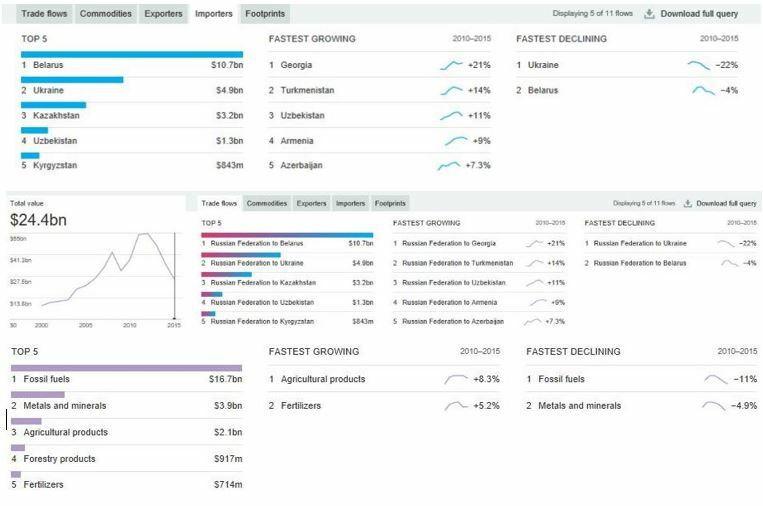 Imports to Moldova are down to only 308 million dollars according to the table 9. The opposite case of the small developed economy, demonstrate the results of Latvian high import - export figures which point to the strong economic ties on Russian Federation and the reliance on Russian energetics. The products in value nearly 6.7 billion dollars are imported from Russia to Latvia (Table 9) which is 48% of import to total import (Table 9). 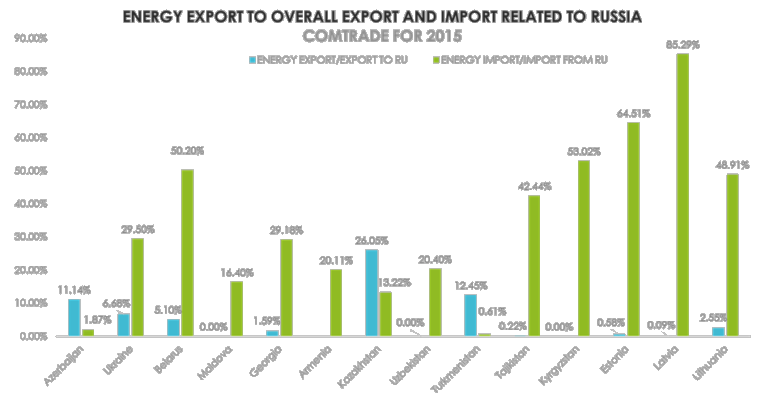 Import of energetics (natural gaz and crude oil) reaches almost 86% of overall imports from RU (Table 19 and Graph 20). The dependency of underdeveloped economies in figures will be more transparent in the following chapter considering labor force in Russian Federation and its financial transfers and remittances. All the graphs are the products of tables and include the title and relevant legend, the values of parameters are same as in the tables’ measured either in absolute figures in dollars or in ratios in percentages. Ratios of transfers/remittances to GDP are calculated as simple shares of financial transfer to the overall GDPs of specific country. The financial transfers as a portion of the GDP are denoted in bold percentages and classified by the largest to the smallest. In the post-Soviet space, these transfers make extraordinarily high values compared to GDP and therefore its economic importance is salient. Note: Green represents positive net migration, while red represents negative net migration. Estimates of overall net migration vary based on methodology, with another estimate based on the demographic balance method placing the figure at 9 million from 1991 to 2015. Source: For data since 1997, see Rosstat, “International Migration,” (July 8, 2016), data prior to 1997 from unpublished reports obtained by the authors from Rosstat and the former Federal Migration Service of Russia (now the Directorate General on Migration Issues in the Ministry of Interior). Source: Unpublished reports obtained by the authors from Rosstat and the former Federal Migration Service of Russia (now the Directorate General on Migration Issues in the Ministry of Interior). Many sociodemographic issues and ethnopolitical conflicts in former Soviet region as well as the people flows are to a large extent the result of Soviet-era migration. In the problematic 1990s Russia faced economic recession, rising of illegal migration (mainly labour) and threats of terrorism. Strong push factors were political reforms including elevating other official languages than Russian and armed conflicts in regions of Georgia, Moldova, Tajikistan, Kyrgyzstan, and Ukraine. These caused a flow of refugees into Russia and internally displaced persons of different ethnic groups (Olga Chudinovskikh, 2017). The concentration of the post-Soviet population is equally developed on urbanic and sub-urbanic basis of movement of individuals. The newly independent post-Soviet states began setting up their own institutions to regulate migration and citizenship whereas Russian immigration law needed a plenty of reforms. Since that time, Russia implemented a set of commonly used migration management tools, including entry visas, work permits, visas to attract foreign employees, registration of place of stay for citizens and foreigners, and permits for permanent and temporary residence. Net authorized immigration from other former republics resulted in an increase of 7.5 million people between 1991 and 2015. 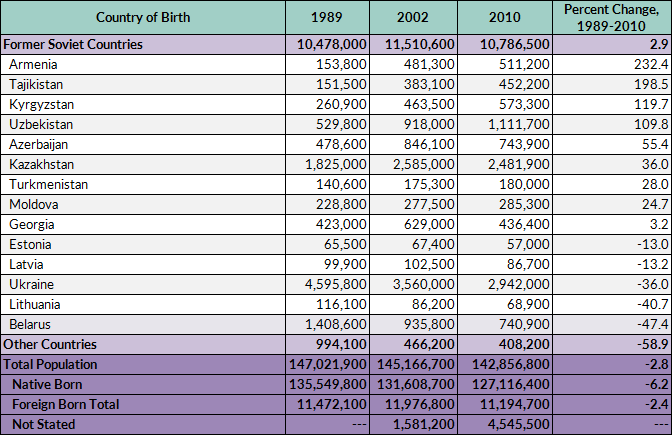 The main contributors were Kazakhstan and Uzbekistan (due to new migration flows, as well as modified counting methods), and Ukraine (Table 23). Meanwhile, over the same period Russia experienced a net loss of more than 1 million nationals from countries outside the former Soviet Union (Table 23). Migration has been beneficial for Russia, countries of origin, and migrants themselves. Immigration allowed Russia to compensate for almost 60 percent of the natural population loss experienced following the collapse of the Soviet Union. (FGUP, 2017 ) In the 1990s, Russia benefitted from a significant redistribution of human capital, owing to the higher skill and education levels of arriving Russian-speaking migrants. In this way, the loss of skilled labor due to mass migration beyond the borders of the former Soviet Union was offset. However, migration flows in the past decade (with the possible exception of forced migrants from Ukraine, who arrived in 2014–15) have been very different, with lower education levels on average. (Ryazantsev, 2016) Morover, the integration of migrants receives only little policy attention, though the simplified citizenship acquisition process makes integration needs difficult to discern. 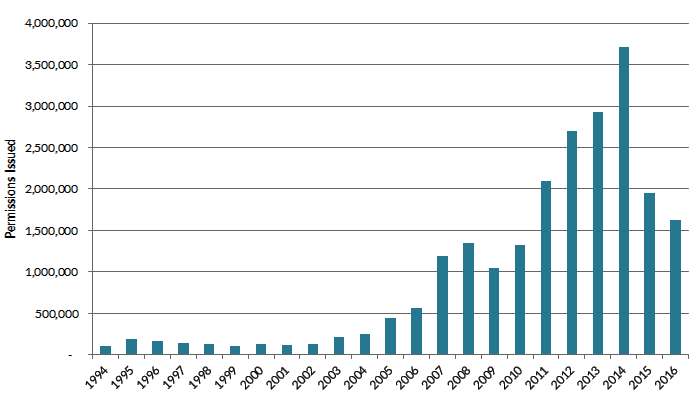 From 1992 to 2015, about 8.5 million people acquired Russian citizenship. (FGUP, 2017 ) Many residents of post-Soviet states have viewed attaining Russian citizenship as a desirable goal. Until 2002, naturalization was regulated by an extremely liberal citizenship law, allowing individuals to apply for citizenship by submitting an application to the Ministry of Interior if in Russia or to Russian consulates if abroad. Hundreds of thousands of residents in former Soviet republics took advantage of this opportunity, allowing them to avoid bureaucratic difficulties while moving to and settling in Russia. A new law on citizenship in 2002 and subsequent amendments in 2003 simplified naturalization for most applicants, requiring only a temporary residence permit and a waiting period of no more than 1.5 years. (Olga Chudinovskikh, 2017) In accordance with international agreements, hundreds of thousands of citizens of Belarus, Kazakhstan, and Kyrgyzstan obtained Russian nationality, some just three months after arriving in Russia. As of late 2011, all foreigners applying for Russian citizenship must have a permanent residence permit, a requirement that extended the application process but in general did not slow the simplified citizenship acquisition process. (Olga Chudinovskikh, 2017) Russia nowadays maintains strong economic, political and cultural ties with residents of former Soviet states as seen in continuous migration patterns, Russia works to strengthen the citizenship policies. The combined effect of several economic factors contributes to the formation of the labour migration flows from Central Asia to Russia; eclining production, low salaries, high unemployment, job shortages, increasing poverty, and an idle workforce. (Ryazantsev, 2016) Out of Central Asia, only the remittances of Uzbekistan, Kyrgyzstan and Tajikistan from Russia respectively make nearly 3.5 billion dollars for 2016, Ukraine as the third dominating country is at 622 millions of dollars (Table 25). For financial transfers Kyrgyzstan, Tajikistan and Uzbekistan respectively make together almost 6.5 billion dollars for 2016. Latvia which absolutely dominates the total financial transfers peaks at 2.1 billion dollars for 2016. It is equally the only country with salient results where the official residents in Russia outperform the non-resident individuals. According to the World Bank, Kyrgyzstan and Turkmenistan placed first and second among all countries as share of GDP at 14,9% and 8,3% for remittances and Tajikistan with 27% and Kyrgystan 26% for transfers respectively. More than 1.6 million people from Central Asian countries received Russian citizenship in 2001–2011. Because many were labour migrants, returning migrants, and student migrants, as well as refugees, they made a major contribution to Russia’s demographic and labour potential. Many studies show that households spend such remittances on daily expenses, thus spurring short-term growth in economic sectors producing such everyday goods as food and services, as well as in housing construction. (Ryazantsev, 2016) The growth of the construction industry in Russia’s largest cities happens due to the use of cheap labour from abroad. Financial transfers and remittances sent back to domestic countries elevate the annual GDPs of the former Soviet republics. Overall, the economic performance was demonstrated through the rough data of economic indicators, international and regional formation participation and mutual economic relations were discussed. We have denoted the international trade statistics and finally compared the diaspora of former-Soviet republics living in Russia and its financial transfers. The collapse of the Soviet Union in 1991 followed by the economic recession of the Russian Federation contributed to the recognition of the United States as the economic and political world superpower. The concentration of power was later on, by the economic evolution distributed to the world multipolar leadership. (Kissinger, 2014) In case of post-Soviet republics factually, among the European Union, Russian Federation and China. Altough Russian Federation‘s sphere of influence persisted and dominates in the entire Euro-Asian region, especially then in the Central Asia, Eastern Europe and Transcaucasia. The country with the vastest territory on Earth counts on enormous wealth in natural resources like natural gaz or crude oil, wood, water, coal, uranium and many others which enable to influence through trade the economic affairs in the whole former-Soviet region. Its economic fragility is visible from the turbulent flactuations of the economic indicators related to events of international or regional character. That is also why Russia is considered an emerging economy and part of BRICS formation. Russian reactions on trade are transmitted to the Euro-Asian region countries depending on the strenght of the political and economic ties. Russia employs trade and military agents through the international and regional organizations, specifically Euro-Asian Economic Union, Commonwealth of Independent States Free Trade Area and Collective Security Treaty Organizations in order to maintain its power. The 14 former Soviet republics keep the mutual economic relations through trade but the economic ties to Russian Federation remain predominant. The Russian Federation is a decisive player throuought the entire analysis of the post-Soviet space in the domain of international and regional formations and organizations, in the import & export orientations, the concentration of diaspora as well as of financial transfers and remittances and the GDP per capita trends in the region. However, the extent to which the level of economic influence is spread among the former post-Soviet republics significantly varies. The stronger or weaker economic dependency relies on many factors as geopolitical location, size and strenght of economy, political and trade partnerships, scarce and abundant factors in economy, openess of the borders, strenght of the private sector and so on. Based on the analysis‘ factual data former Soviet republics can be nowadays classified into imaginary three groups, the countries that are absolutely dependent on their ex-Soviet leader until now and their economy is guided by the Russian one. Then, countries that are to bigger or lesser extent economically relient meant that they can also lose from that partnership and countries that went their propre way and rely more on the relationships with different countries. According to the figures and partnerships, Estonia and Lithuania would be the case of the economically not dependent individal players. Latvia in this sens is little bit nuanced as it maintains a large portion of rusophone diaspora that has significant decisive economic and politcal voice. Furthermore, Latvia has the highest levels of import from Russian Federation for 2015 of all countries whereas the major part of that is related to oil and gaz delivery. They also place the third for financial transfers from Russia to their gross domestic product. Countries that need the collaboration with Russia to the bigger or lesser extent are based on the analysis; Moldova, Georgia, Azerbaijan, Ukraine and Armenia respectively. Moldova represents the promising applicant to the European Union, does not share the border with RF and except for the exportation to the Russian Federation does not denote high trends inclining to Russian-Moldovan cooperation (compared to other states). Together with Georgia and Ukraine, they are sometimes seen as the countering position takers in the area who use a part of strategy backed by United States. That of course might be only assumptions. Georgia represents also an interested party in the Application treaty and compared to Moldova, is Russian neighbour and the fastest growing importation partner according to figures. Another neighbour and trade partner of Russia, Azerbaijan plays a unique role of the fastest growing emergent economy according to population trends (2000-2015) and GDP trends (2000-2016) similarly as the rest of the Central Asian countries. Compared to their economies however, AZ is self-sufficient in the natural resources whom it exports in large volumes to Europe, namely fossil fuels and minerals. Azerbaijan does not reach high figures in terms of trade exchanges with Russia when compared to others and its economic wealth gives it the opportunity to profit from its strong neighbour but equally to deal with Europe and China. Ukraine which lived up the western integration expectations is nowadays still politically divided between the West and East. It is also an Association treaty applicant which due to the inner armed conflict as well as the conflict with its neighbour went to the deep economic recession according to figures. Unfortunately for Ukraine – agricultural economy, it is strongly reliant on crude oil and natural gaz importations from Russia, which makes it more difficult for them to go their own economic way. Although big part of Ukrainian population feels like diverting from Russian-Ukrainian trade, Ukraine still needs Russia especially in tough times of economic reccession paradoxically caused by Russia. Armenia is the closest „lesser-bigger extent partner“ holding historical strategic partnership with Russia. That is transparent in terms of armenian population trends of migrants moving to Russia (1991-2010), escalating remittances and transfers to their GDP for 2016, export to Russia as well as the tactical participation in all key economic and political organizations and formations. Strategic partnership might be profitable for the armenian security objectives, trade advantages altough remain questionable as for example gaz and oil delivery prices refer to overpriced values compared to those offered by different subjects. The position of absolutely dependent subjects economically refer to Belarus and Central Asian countries (without Azerbaijan). Kazakhstan as the least dependent of the entity is almost sovereign in terms of natural resources. Reliance is obvious from the net immigration trends (1991-2015) with Kazakhstan’s leading position along together with Kazakh population living in Russia in 2010. 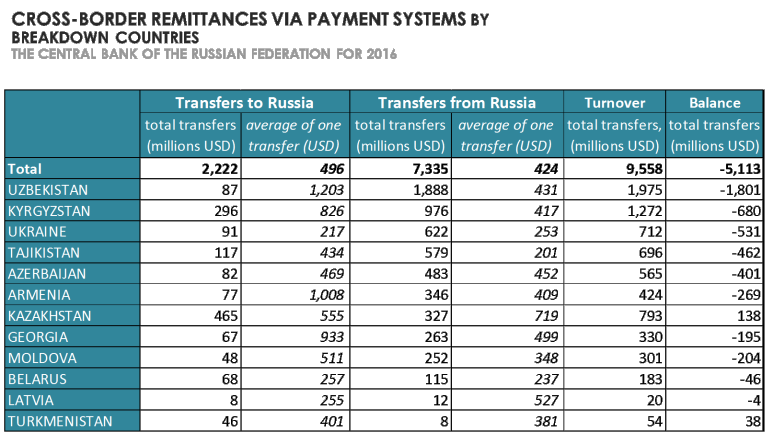 Remittances send to Russia are also the third highest which indicates high frequency of exchange of people among those two countries. Import and export figures equally reach high values. In the international and regional formations Kazakhstan similarly as the rest of the Central Asia keeps nearly the identical participations as RF. Belarus is the closest trade partner to Russia, being together in the Union State, the frequence of import and export exchanges is absolutely dominant out of the former-Soviet countries. As a manifacturing state it is equally not self-suficient in energetics therefore dependent on the Russian deliveries. Its centralized political authority is in a close relationship to the Russian one which also reflects the partnerships in the international and regional formations. Although suggested by experts, Belarus could diverge from Russia, become fully integrated to Europe and western trade orientations would elevate their living standards regardless their political relationship with RF of course. Turkmenistan, Uzbekistan, Tajikistan and Kyrgistan are classified as higly reliant economies on Russia even though their import and exports outcomes remain low due to thier underdeveloped economies; low dynamics, low productivity and the overall poverty of natural and corporate persons. The assassement of the propre order of Central Asian countries‘ dependency is not an easy task. All of them dominate in the GDP and population trends 2000-2016) and therefore are considiered emerging fastly growing economies of underutilized potential that are absolutely dependent on Russia. Uzbekistan, Tajikistan and Kyrgyzstan also hold the strategic formations with Russia as namely Collective Security Treaty Organization and Commonwealth of Independent States Free Trade Area that enables them easier political and economic cooperation. According to the analysis, the Turkmenistan stays out of any international and regional formations and above all uses the most restrictive policies towards movement of individuals and products. Its governmental structure also stands on strong presidential basis and firmly centralized powers. Therefore, from the former-Soviet space its regime is the closest to the authoritarian one. 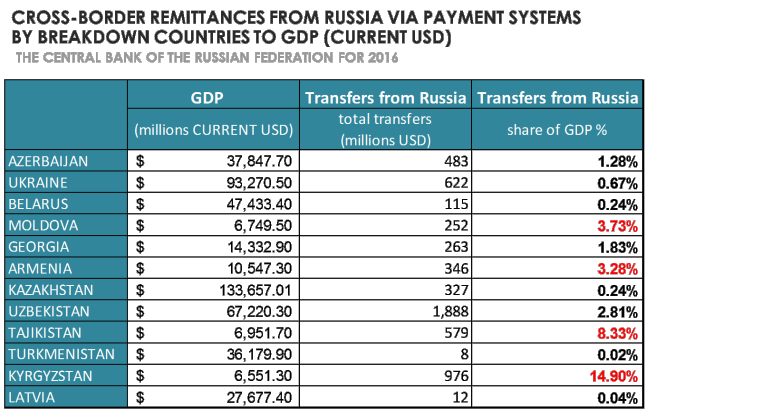 Uzbekistan, Tajikistan and Kyrgyzstan have all been major players in financial transfers and remittances from Russia for 2016 and net immigration to Russia (1991-2015) within the analysis which confirms the absolute dependency of their economies. Russian Federation is seen as a destabilisator of european safety zone but also potential future political and economic partner. RF is also a member of Security Council of United Nations and potential major player in many issues of international relations character. The prospective collaboration of Russia with western formations depends on the respect of RF to the international law and territorial integrity of its neighbours. Will Russian economic influence within the post-Soviet space persist or perhaps strenghten or will the former-Soviet republics incline to the different trade partners in the near future? .adb.org. (2017). About ADB. www.adb.org/about/main. Britannica, E. (May 5, 2017). Comecon. Britannica, T. E. (20). Commonwealth of Independent States (CIS). Britannica.com. cia.gov/library. (2016). BUDGET SURPLUS OR DEFICIT BY COUNTRY . Central Intelligence Agency . cia.gov/library. (2016). COUNTRY COMPARISON; AREA. cia.gov/library. cisstat.com. (2017). About CIS . comtrade.un. (2015). UN COMTRADE DATABASE . comtrade.un.org/data. eaeunion.org. (2014 ). Official information . eaeunion.org. ECB.europa. (2017). Organizations, History, Tasks. ECB.europa.eu . FGUP, P. R. (2017 ). Data on Cross-border Transfers of Individuals . Reports on Credit institutions . foreign-trade.com. (2017). Harmonized System Codes . Foreign Trade Online . guam-organization.org. (2017). History of GUAM. http://guam-organization.org/en. History. (2011). Fall of the Soviet Union. A+E Networks. investopedia.com. (2017). Gross domestic product-GDP. INVESTOPEDIA. Johnson, P. (1983). History of the 20th Century. In P. Johnson, History of the 20th Century (p. 430). LEDA. Kissinger, H. (2014). World Order. Penguin press. mfa.gov.tr. (2017 ). THE COOPERATION COUNCIL OF TURKIC SPEAKING STATES. Republic of Turkey, Ministry of Foreign affairs. odkb.gov.ru. (2017). Basic information. ODKB. oicun.org. (2017). About OIC . OICUN. Olga Chudinovskikh, M. D. (2017). Russia: A Migration System with Soviet Roots. Moscow: .migrationpolicy.org. Ryazantsev, S. (2016). 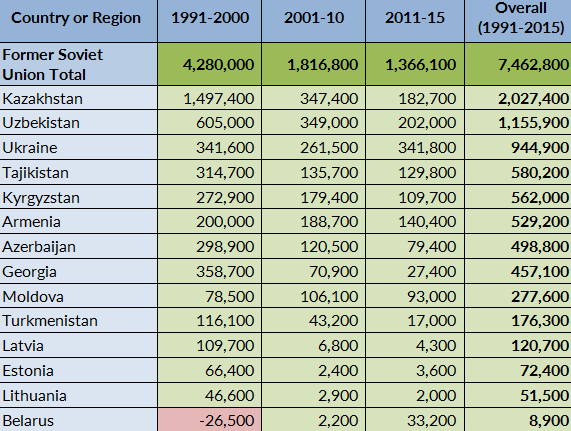 Labor Migration from Central Asia to Russia in the context of Economic crisis. Moscow : Russia in Global Affairs . Socor, V. (2006). CIS SPLIT AT MINISTERIAL CONFERENCE . Eurasia daily monitor . stat.wto.org. (2015). Country Trade Profile. World Trade Organization . TIMES, N. (January 3, 1988). Warsaw Pact and Comecon: Formal Ties. New York: www.nytimes.com. turkkon.org. (2017). General Information. www.turkkon.org. unstats.un.org. (2017). Harmonized Commodity Description and Coding systems (HS). UN TRADE STATISTICS. WorldBank. (2016). World Development Indicators. the World Bank. Zharikhin, V. (2017). Has Russia Been able to build its own NATO? . Russia beyond the headlines.